This hefty volume brings together three collections of newspaper columns by the pseudonymous Marchbanks. Written in the late 40's, during Davies' years as an editor and publisher, these musings, Perishes, obiter dicta, apophthegms, diary entries, and letters are only now available outside Davies' native Canada. To be more precise, these papers comprise The Diary, The Table Talk, and a Garland of Miscellanea by the aforementioned Marchbanks, but are "enlarged (to include a Biographical Introduction and Copious Notes calculated to remove all Difficulties caused by the passing of Time and to offer the Wisdom, not to speak of the Whimsicality, of this astonishing man to the Modern Public, in the most convenient form) by his long-suffering friend" and alter-ego Davies. To meet Marchbanks through these pages is to meet a curmudgeon of the highest order--a true misanthrope, an individualist of the most retrograde kind. Marchbanks, "a man whose temperament is philosophical and whose habits are sedentary," brings new meaning to the word "cantankerous." His enthusiasms, though few, help ease the dull routine of life's absurdities, and include cats, sherry, and Gypsy Rose Lee. More often, he confronts "an endless procession of vexing domestic problems," from his ongoing battle with an infernal furnace to his struggle against Nature in his pitiful garden. He rants and rafts against censors, the State, taxes, Hollywood, the masses, banks, machines, and the "disease of bad manners." In all things, he is by nature contrary." 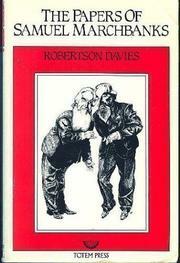 Everyman his own Boswell," Davies proves through his doppel-ganger, and he also provides fair warning: "only a coarse and warty soul could Find food for laughter here." While that invites his many fans, others will find this volume sometimes amusing, but mostly ephemeral.